Students from Christ Episcopal School help make the announcement on Sunday. 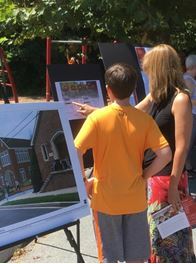 Christ Episcopal Church and School is preparing to ‘right size’ its property and real estate with a new classroom building. In addition, all the existing classrooms and restrooms in the lower school will be remodeled and numerous improvements are planned for the church including a new elevator and other deferred maintenance. All of the improvements for both church and school are estimated to cost approximately $4 million with another $500,000 earmarked for a reserve fund. If the entire project can be completed, both church and school will not only enjoy significantly upgraded and efficient spaces, they will also be completely debt free. Paul Mamalian and George Wolohojian are serving as Co-Chairs of the campaign and on Sunday afternoon during a casual picnic gathering on the grounds, they were happy to report to the crowd the inspirational level of support already committed from just a small group of donors. 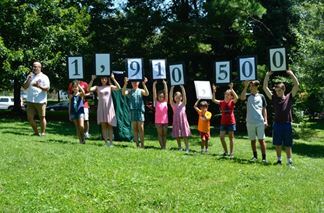 The $1.9 million in pledges is a level of success that neither Christ Episcopal Church or School had ever achieved before in any campaign, much less by the public Kick-Off! Kickoff attendees view the new plans. The stage is now set to engage the church and school community in raising the rest of the dollars necessary to complete the entire project. Personal visits with church members, school families, alumni and other interested individuals will continue through September. Both Senior Minister John McDuffie and Head of School Caroline Chapin have commented that they’re having fun learning and practicing new skills in how to ask for financial support. Steve Siegel is the consultant serving Christ Episcopal Church and School from WD&R. It’s been a rewarding project for him because the leaders on the steering committee have been good students of the process and have followed the principles of the campaign plan even if they had some doubts early on. With offices in Falls Church, Virginia; Chicago, Illinois; Los Angeles, California; and Toronto, Ontario, Ward, Dreshman and Reinhardt is the largest full-time, on-site stewardship consulting firm in North America. For additional information, please contact the firm at www.jdklote.com or (800)-360-2315.